Students sometimes get confused between the research topic and the research question. I like to think of the research topic being at one end of a continuum, and the research question being at the other end. 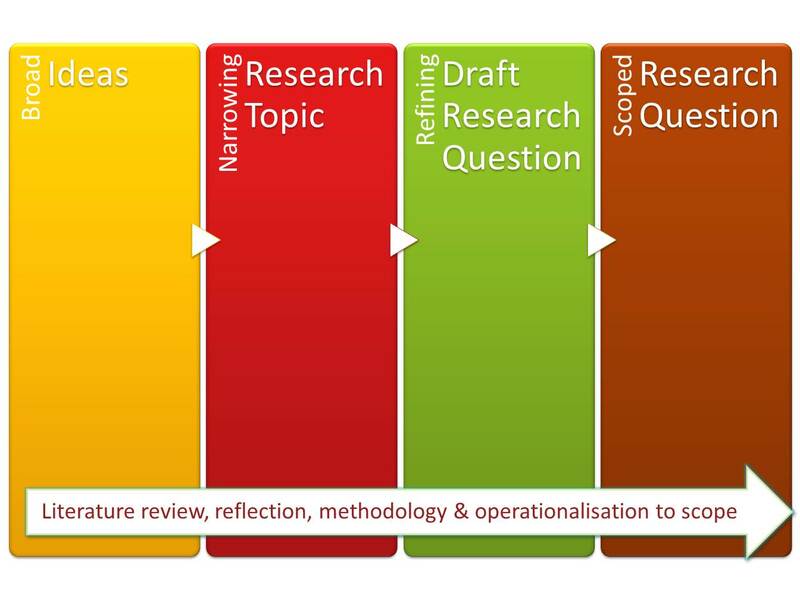 All our work in our early research work is to confine, scope, narrow and chisel away at our research idea, topic and draft question to get to a scoped, answerable research question. The more time we spend here with quality thought, the easier our research project will be. It appears that the definition of the research topic and the question may differ slightly between quantitative and qualitative research methods. As someone who does mostly qualitative research, I am using qualitative research definitions. The research topic can be defined as "a subject or issue that a researcher is interested in when conducting research. A well-defined research topic is the starting point of every successful research project. Choosing a topic is an ongoing process by which researchers explore, define, and refine their ideas" (Allen, 2017). The research question has been defined by the Sage Encyclopedia of Qualitative Research as "what researchers want to understand about the research problem that led to their study. Research questions further specify the stated purpose of the study, which in turn addresses the stated research problem" and, "in qualitative research are broad enough to permit the discovery of the specific experiences, events, artifacts, concepts, or other empirical and/or analytic subjects that will ultimately be the focus of study" (Given, 2008, p. 786). A research problem is "what researchers perceive is wrong, missing, or puzzling, or what requires changing, in the world" (p. 784). 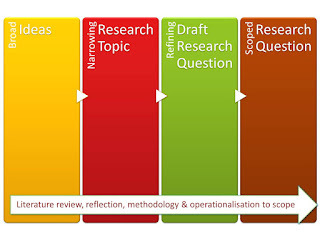 There is a four step process to walk us from the research topic to the research question, which includes (a) getting large broad ideas for a research project which are then narrowed down to (b) a research topic which identifies a specific gap in the knowledge, is more defined, more scoped, and closer to a research question, then (c) turning the topic into a research question which is again more scoped and is closer to a specific question which can be answered, to (d) a refined, answerable research question with a defined method (Allen, 2017). Hopefully that makes the topic and the question clearer. Given, L. M. (Ed) (2008). The Sage Encyclopedia of Qualitative Research Methods (Volumes 1 & 2). 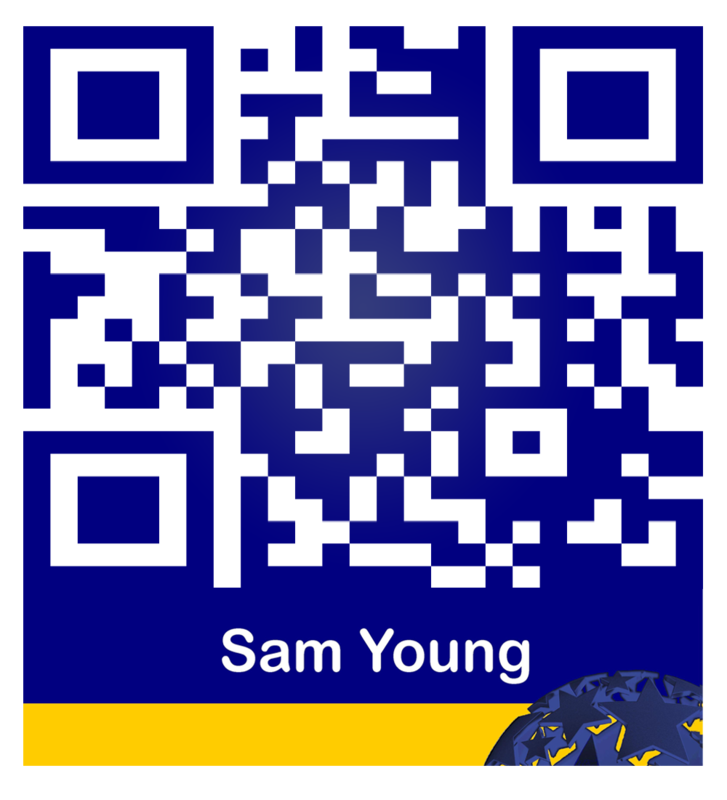 Thousand Oaks CA, USA: SAGE Publications, Inc.